eNow showcased its mobile solar systems at the 2018 Mobile Laboratory Coalition Conference in Detroit, MI on July 25-27. STEM professionals and educators from around the world gathered there to learn about advances in mobile teaching labs – such as powering mobile laboratories with eNow’s mobile solar systems. Traveling laboratory education programs help address the nation’s science education challenge by providing equity of access to authentic hands-on, inquiry-based, contemporary science education for K-12 students. The Mobile Laboratory Coalition conference was hosted by Triune Specialty Trailers and MdBio Foundation and takes place at Wayne State University. 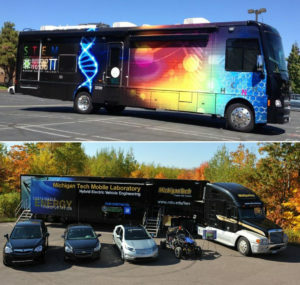 Photos: (top) courtesy of Mobile Laboratory Coalition; (bottom) eNow-powered Navistar Super Truck; (inset) eNow’s mobile solar power system demo vehicle.